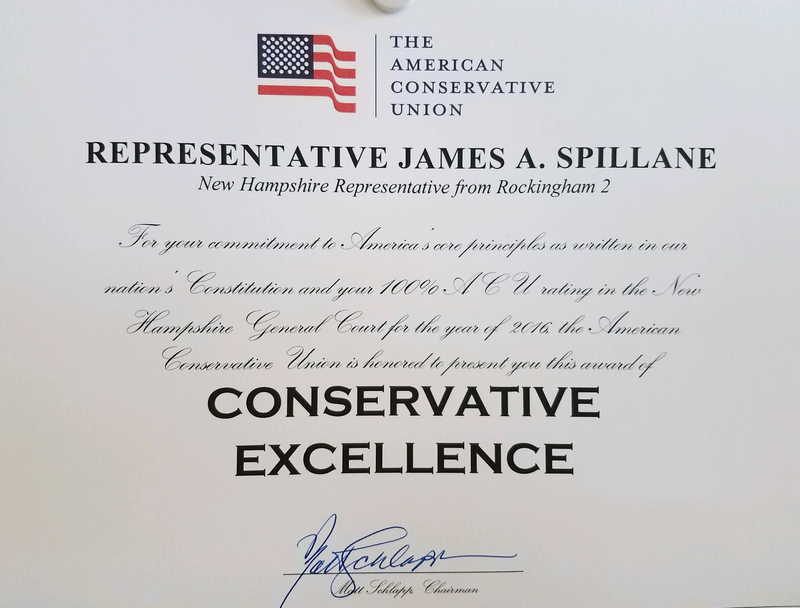 The American Conservative Union Foundation has sent a letter informing Candidate for and current State Representative James Spillane that he has earned an ACU Ratings Award for his excellent voting record in the 2016 session of the New Hampshire General Court. The ACU Foundation stated that it has been “rating the U.S. Congress for 46 years and state legislatures for six” and they they will make a formal announcement of his achievement to the press next week. 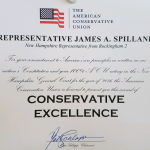 James was invited to receive his award next Saturday, September 10th, at the Grappone Conference Center in Concord. The ACU Foundation, in conjunction with the Granite Institute, is hosting a leadership summit there from 2:00 PM to 5:00 PM on the heroin crisis facing New Hampshire and the rest of the country. Following the summit, the ACU will host a reception where James will be presented with his award.